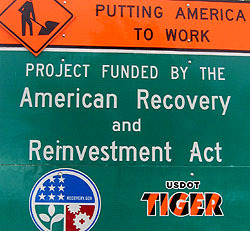 Meanwhile, lower-than-anticipated costs for some projects have permitted the administration to stretch stimulus money further than expected, financing an additional 3,000 projects, according to the report…”Certainly, the fraud and waste element has been smaller than I think anything anybody anticipated,” said Steve Ellis, vice president of Taxpayers for Common Sense, a nonpartisan watchdog group. …An independent board established to provide oversight has received just 3,806 complaints — less than 2 percent of more than 200,000 awards. Prosecutors have initiated 424 criminal investigations, representing 0.2 percent of all awards. Typically, 5 to 7 percent of government contracts attract complaints, [Jared] Bernstein said. According to CBO reports, the stimulus has created 3.5 million jobs and kept unemployment about 1 to 2 percent lower than it otherwise would have been, and apparently it’s accomplished this efficiently and with minimal waste. It’s a testament to what happens when you take good policy seriously. Unfortunately, it’s also a testament to how little most people care about good policy and competent execution. As near as I can tell, it’s practically conventional wisdom these days that the stimulus package was a complete bust—and all because the Obama administration initially made a lousy projection about the future course of the recession and suggested that the stimulus package would reduce unemployment to 8 percent. If their forecast of the depth of the recession had been correct and they’d predicted, say, 11.5 percent unemployment without a stimulus package and 10 percent with it—which is what happened—elite opinion about the stimulus would probably be completely different. So there you have it. Good policy and good execution gets you bubkes. All it takes is one wrong forecast number to wipe it all out. Welcome to the real world.